This commercial grade canopy tent is an excellent addition to any party tent rental or event business, as well as the perfect party tent for your outdoor event, including weddings, graduations, church functions, reunions and more. Our 30' Wide Premium Pole Tent with Single Piece tops can accommodate a large number of guests, are easy to set up and made from durable, high-quality materials. Pole tents get their classic look from the center tent pole that supports the vinyl tent top, which is then stretched across to the side poles. 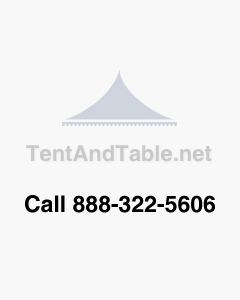 The single piece tent top is waterproof, flame resistant, UV resistant, mold resistant and mildew resistant. The fabric is a heavier 16oz/yard PVC coated polyester blockout material that will not show staining and has a durable finish. The side and center poles are constructed from anodized aluminum that is lighter in weight than steel, highly resistant to rusting and corrosion, ultra-durable and won't stain your tent top vinyl. Seating Capacity - A standard event planners rule for comfortable seating is 10 square feet per person to allow for table and chair seating. Our best quality, PVC-coated polyester material.